This is the experimental setup used to assess softening temperatures while a rectangular piece of glass was heated at a constant rate under the simultaneous application of a mechanical load and an electric field. Image: Jain. While listening to Rishi Raj, a professor of mechanical engineering at the University of Colorado Boulder, speak at a conference about the remarkable effect of moderate electrical fields on lowering the sintering temperature of certain ceramic powders, Himanshu Jain, a professor of materials science and engineering at Lehigh University, had a flash of inspiration. Would a similar phenomenon be possible in a glass, because if so the implications could be huge for glass technology? The two professors chatted briefly during a coffee break and a spontaneous collaboration to explore the possibility began. As the professors and their colleagues now report in Applied Physics Letters, a similar, albeit slightly different, phenomenon is indeed possible in a glass. The basis of the team's work and experiments is fairly straightforward: glass softens upon heating in a furnace, causing it to deform rapidly under the application of a compressive load, as happens when shaping glass. "We wanted to discover whether or not 'softening behavior' could be significantly enhanced by the additional application of an electric field," said Jain. 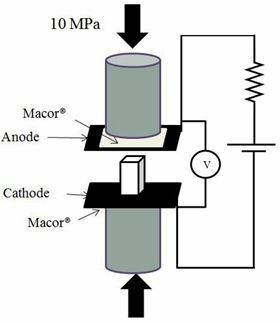 So they ran a series of experiments that assessed softening temperatures while a rectangular piece of glass was heated at a constant rate under the simultaneous application of a mechanical load and an electric field. Then, to "establish the generality of phenomenon and to develop an understanding of underlying mechanisms, we performed experiments on a few different glass compositions of varying properties," he noted. Forming glass products into specific shapes requires high temperatures and so consumes a considerable amount of energy. "Electrical heating is widely used in the initial melting process, but not for 'forming operations,' which require glass to be soft and easily deformable, while also keeping the desired shape," explained Jain. The team's approach, which "lowers the softening temperature by electric field, offers the potential to save significant amounts of energy, but may also end up leading to innovative methods of 'micro-forming' because electric fields can be manipulated much more precisely and selectively than plain old heating," he added. For the team, actually observing the softening of glass at a significantly lower furnace temperature was the most exciting part of their experiments. There were, however, some surprises along the way. "One of these 'unexpected results' was that soon after the softening of glass, we observed a strong glow coming from the anode region," Jain revealed. "Upon continued application of electrical field, we observed smoke and substantial destruction of the sample." In terms of applications for the team's work, the results of their study will prove extremely useful for micro- and nano-scale glass shaping, as well as for high-precision nanostamping. The same applies to modifying physical properties near electrodes. "Gaining a better understanding of the underlying phenomenon will help us learn the limitations of glass as an electrical insulator," noted Jain. "There's tremendous interest in using glass as a supercapacitor for energy storage, for example. But it's critical not to use glass that deforms easily in such applications, so it would be helpful to know in advance how the glass will behave." Now that the team has discovered this phenomenon of electric field-induced softening of glass, they’re beginning to explore its mechanisms and behavior during various stages. One way to do this is to perform experiments on a broader variety of glasses with specific characteristics. "This will help us to identify glass compositions for specific applications that exploit electric-field-induced softening," Jain said. Their goal now is to further develop electric-field-induced softening for practical applications with an industry partner.